Had the pleasure of having Amy and Jacob as guides. They were amazing and made the experience one to remember. Thanks again for your enthusiasm and commitment to the work that you do. We both enjoyed it sooo much. Hat alles super geklappt, kann man nur weiter empfehlen. Great to see these iconic locations. Unfortunately we did not receive information from our tour guide about going on to the afternoon tour if you had selected that, which we had and we miss out on that part. The afternoon guide caught up with us later on and provided us with our tickets to the one world viewing platform. Big tick to Amanda to catching up with us at the end. Our tour guide Jeff was amazing! Funny and Knowledgable! The Liberty/Ellis/Observatory all in one day is a lot. I wouldn't recommend doing all 3 if you are not used to being on your feet. Well worth the money to get the historical insights. I really enjoyed this tour. But I must share my Words of Experience that I wasn't expecting: I didn't realize there were 2 separate tours. I thought we would be with the same group. Turned out in the morning was the Statue of Liberty and Ellis Island. That ended in the afternoon. Then there was a 2 hour gap where we were supposed to met at this church for the 2nd half of the tour Lower Manhattan and One World. Well we went to the wrong Church, walked a few more blocks down and saw a group of people and found our group. I swear, if I didn't ask our first tour guide I would have never figured this out. So we started the tour at 9am earlier since you have to get yourself to Battery Park finished the first half around 1pm. Started the 2nd tour around 3pm and didn't end till 8pm. Mind you this was in November. My new husband and I were freezing and tired because this is an ALL DAY WALKING TOUR. My poor hubby got so sick by the end of the day. Knowing what I know now...I've done the Statue and Ellis Island I only did that for my hubby. Next time I would just do the Manhattan Sightseeing and One World. The 2nd half of the tour, even though we were freezing, tired, and sick I LOVED it. Seeing the memorial to the world trade...there's....there's just nothing like it. Excellent tour! 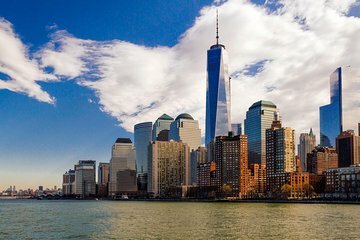 Did this tour the first day and it was a great overview of Manhattan! Rob was great extremely tolerablete of a disruptive couple on the tour and he was very knowledgeable of the city and what 9/11 meant.